Experience the best of Columbus and Central Ohio with one of our unique brewery tours. If you’re looking for memorable things to do in Columbus, our tours are not to be missed! We offer van-based and walking tours of Columbus and surrounding areas, and even tailor-made private brew tours to suit your needs. Our offerings include a walking tour of the Brewery District, a pairing of Ohio Craft beer with four of the most iconic pizza places in town. We are happy to create a tour that will please everyone in your group. Visit our brew tour event calendar to see our upcoming tours. We offer tours all year round. Our tours commonly sell out in advance so please plan ahead. 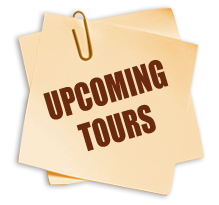 Keep an eye out for our other seasonal offerings (usually posted 1 month or more before the first date) including Buckeye Lake/Granville, specialty tours, haunted brewery/winery tour, distilleries, wineries and more. Our Downtown Tour includes some of the most well established and acclaimed breweries in town as well as some of the newest and most exciting micro-brewers. Explore wild and sour beers in depth at 3 breweries. Tour three very different breweries to learn about craft beer on the west side of Columbus. Learn about the full range of craft beverages being produced in Columbus including beer, mead, cider and spirits. A walking tour of the historic Brewery District featuring history, trivia and of course beer. A walking tour of Franklinton which mixes history, behind the scenes access and samples at four craft destinations. Pizza and beer - the classic Columbus combination. On this tour we’ll introduce you to some of the finest pizza in Columbus paired with pours of exceptional local craft beers. A tour that features a rotating lineup of small brewery taprooms. Explore five craft beer destinations in Powell & Delaware. A walking tour of Uptown Westerville and Temperance Row, including history, food and drink. Holiday Cheer Tour, a Short North Walking Tour with holiday drinks, food and neighborhood history. Licking county is alive with the spirit of quality craft micro brewing! We'll visit three very different breweries on this fun tour of the Granville and Buckeye Lake area. Our private food tours offer a unique Columbus attraction that can be tailored to meet your group's needs. Whether you are entertaining family from out of town, hosting a unique birthday party, or a corporate group wishing to explore Columbus, we can offer an itinerary to suit you.